When you think about making homemade noodles, you probably think about passing dough through a pasta press machine and expending hours of effort just to make a small batch of noodles. Undoubtedly, fresh noodles are amazing. 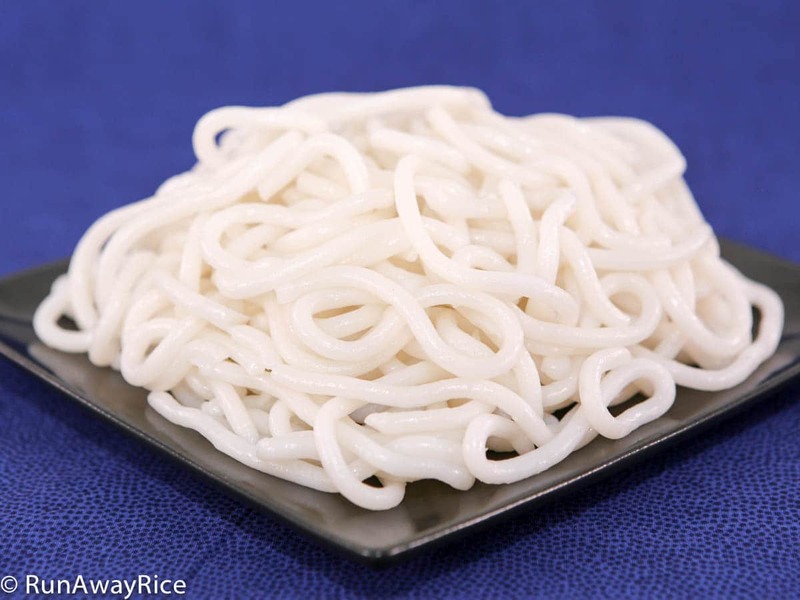 This recipe for Thick Noodles is completely different and much simpler. It doesn’t require a lot of equipment, just a potato ricer. If you don’t have a potato ricer, you can simply roll-out the dough and cut the noodles by hand. The dough requires no resting time so you can make the dough, boil the noodles and have fresh, homemade noodles in about 15 minutes. How’s that for fast!?!? Be sure to use boiling water. The boiling water is needed to cook the rice flour and tapioca starch and activate the elasticity in the dough. If you are not able to stretch the dough or it’s breaking off in chunks, the water was not hot enough. This means when you run the dough through the potato ricer, the noodles break into little bits instead of forming into long strands. If this happens, microwave the dough for 1-2 minutes on High and see if that improves the elasticity. Click the link to see product information for the my potato ricer. There are lots of comparable products but I like this one the best because it’s light-weight, easy to use and inexpensive. If you enjoyed this recipe, you may also like: Pressure Cooker Pho Ga/Vietnamese Chicken Noodle Soup and Crab Noodle Soup (Bun Rieu). Your instructions are terrific. Can I prepare and freeze the noodles in advance and if so, how many days can it keep, how should I pack/stack them, and then defrosting method? I’m expecting extended family on in a week’s time. Yes, you can freeze the cooked noodles for up to 2 months. If you have a Food Saver this works really well. Removing the air keeps the noodles fresh longer and they won’t get freezer burn. If you don’t have a Food Saver, package the noodles in freezer bags. Try to remove as much air as possible from the bags. The flat pack will also make it easier to store/stack them in the freezer. Allow to defrost in the fridge or at room temperature. You can warm the noodles in the microwave or blanch in boiling water. I hope that helps! Please let me know if you have any questions and Good Luck! I’ve done the fresh noodles numerous time so I know how the dough should go through the ricer. What am I doing wrong this time? My dough was extremely hard to push through the ricer. The noodles broke off instead of staying as one long strand. When I open the ricer to put another dough ball in, there’s a lot of drier dough still in the ricer that had to be removed. Is it possible that my water wasn’t hot enough? The water needs to be boiling hot. Boiling water makes the dough stretchy, pliable and able to be pushed through the ricer into strands rather than breaking off. After mixing the dough, you should be able to grab some of it and stretch it to about 6 inches. If the dough breaks, the water was too cool. Here’s a quick fix if your dough isn’t pliable: Put the dough in the microwave and cook for 30 seconds-60 seconds. Knead the dough a bit. Repeat these steps until the dough is soft and stretchy. If you need to add more water, make sure it’s boiling water. Give this a try and let me know how it works out for you. Good Luck! I’ve made several of your dishes and love your clear and concise instructions. I used the noodles here to make a banh tam bi and they were awesome. I do not have a ricer with the larger holes so I cut by hand. My only issue is that my cooked noodles stuck together even when I oiled them quite well. Also, in putting them together and serving, the noodles all broke to about inch and half chunks..still delicious but wonder if I”m doing something wrong? I’m a huge fun…yours is my go to site for Vietnamese dishes! Thank you for your kind words. I am glad to hear you’re enjoying the recipes. The noodles are somewhat delicate and pulling and stretching too much may cause them to break. If the noodles are cold, it helps to warm them up a bit in the microwave. This will make them soft and pliable and easier to move. The cooked noodles really shouldn’t break unless they were really tangled together. Perhaps spread them out on a larger plate. This will help with sticking together and may make the noodles easier to move around and serve. Good Luck! Thanks Trang! Second time’s a charm. I think what happened the first time was that the initial dough I made was too wet in the mixer so I added some powder. However, I don’t think the dough was hot enough to strengthen the dough. This time, I also had to add some more powder but I popped the dough into the micro for a couple of minutes and the noodles were perfect…they were chewy and much more robust. They held together when cooking and reheating and when eaten as leftovers the next day. I think your fans would love a Banh Tam Bi recipe! It’s a magical dance of flavours and textures! Thanks again for this recipe…it’s a keeper! I am glad to hear you worked through the earlier challenges. Thanks for sharing your tips on this recipe. I will add Banh Tam Bi to the list for upcoming recipes. Iam doing something wrong if my dough is pretty hard to push out of the potatos ricer? The dough should be soft but it does take a little bit of effort to push it through the potato ricer. Love your site. I’ve made a couple of dishes using your recipes. Thank you for sharing. Fresh noodles sounds inviting, but I do not have KA stand mixer. Is there other way around? If you don’t mind some manual labor, you can mix the dough in a big bowl and then knead by hand until it’s smooth. Hope that helps! Hi Trang. Thanks for the recipe! I’ve made the noodles for the first time following your video. The outcome is amazing and the noodles are delish! Would you be able to work on the fresh rice noodles (bún tươi và bánh phỡ)? It would be great with your tofu and rice noodles dish. I am glad you enjoyed this recipe. These noodles are super easy to make. The fresh rice noodles bún tươi are much more difficult to make. I am experimenting and trying to simplify the recipe but it is challenging. If everything goes well, I’ll share it in the near future. Thanks for stopping by! I’ve copied & pasted quite a few recipes from your website into my email account for future references. There are too many to mention, but some standouts are the “banh tet (New Year Sticky Rice Logs)”, “Cha Ca (Fish Cakes)”, and this recipe. 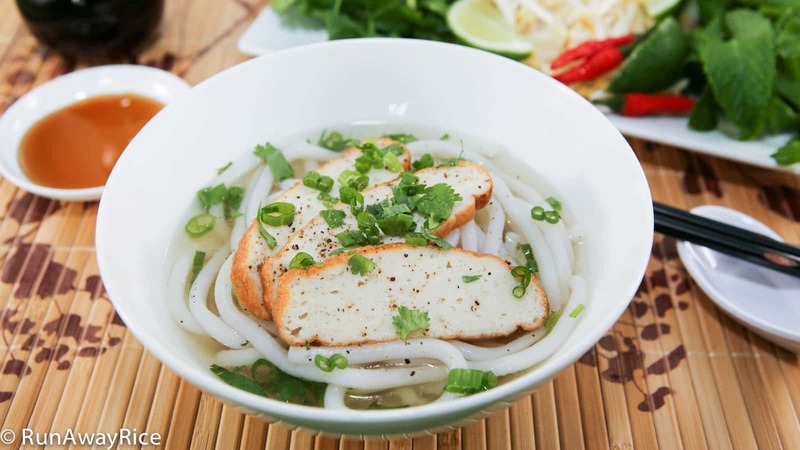 This recipe shows how to make fresh noodles for banh canh, which is one of my favorite Vietnamese dishes. I’ve bought “fresh” banh canh (packaged in plastic bags) from the grocery stores before, but they never tasted the same as home made noodles. So, I’m glad you have a recipe for it here.